Hi, our names are Aaron and Tania Maiolo. We own and operate Skip Bins Plus. Our team endeavour to provide the best skip bin hire service in Melbourne and you can contact me if you have any questions about our services. 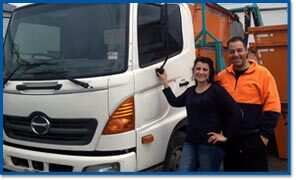 So, why choose us for skip bin hire in Melbourne? With our range of mini skips from 2 cubic meters through to 18 cubic meters, we have a solutions to suit almost any residential or commercial job. We aim to make it easy and affordable for you to hire a skip. You can get a free quote for any of our services by calling 0434 286 307 or using the form on this page to email us. We have a large number of skips available for hire to make sure that you can get one when you need it. We deliver Monday through to Saturday and can arrange a time for delivery and pickup that suits you. Just let us know what will work best for you when you book a skip bin. We are a locally owned family business and we understand how much great service matters! You can always expect our team to be on time, friendly and courteous. If you have any questions before delivery, feel free to contact us and you can always speak to our team during skip delivery or pickup.